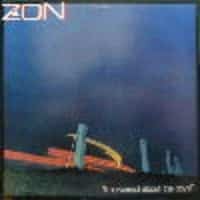 Zon was formed in Toronto in the mid '70s by singer Denton Young (who'd previously played with Act Three), Gary Poplawski on guitar, bassist Rod Chappell and Patrick McGuire on drums. Before long though, Louis Mucilli replaced Poplawski on guitars, Jim Sampson became the new bass player and Kim Hunt (ex of Island and Bond) was the new drummer. They added Howard Helm on keyboards, who recommended Brian Miller for the vacant guitarist position when Mucilli left. They did their rounds of the area's bar circuit while writing their own material and working it into their sets, tailoring it to a progressive rock audience in the same vein as such groups as Klaatu, FM, Rhinegold, and Saga. They signed with Epic Records with distribution from CBS, getting the attention of CBS A&R man Bob Gallo. He took them to Phase One Studios in Toronto and hired Don Lorusso to produce them. ASTRAL PROJECTOR was released in '78 on blue vinyl as an added gimmick. Miller and Mucilli had co-written much of the material during their short tenures in the band, and backed by the single, "Melody," the lead-off "Put On The Show," "Man In The Mirror," and the title track, the album became a staple of FM album rock stations across Ontario and in pockets throughout the country. This led to the band tagging along with some of the biggest concerts of the summer, including opening slots with Styx and The Tubes. The album gained them a Juno nomination for Best New Group. 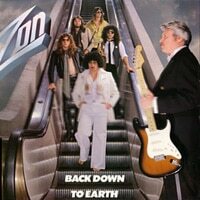 Along with Dale Jacobs, Lorusso was brought back in as producer as the band returned to Phase One and released BACK DOWN TO EARTH in '79. The lead single was "Gods And Kings," and along with other cuts like the b-side "Take It From Me," the lead-off "Circus" (which also made it to a 1979 CBS compilation album called CHOCOLATE HITS), the title track, "Lifeline," and "Suicide," they again found themselves as supporting cast on some major tours, including Foreigner and again with Styx. They returned home to Toronto where they headlined their own show at Maple Leaf Gardens in front of 18,000 people. But a Globe and Mail reporter blasted the band and their show, which made headlines nationwide. As it turned out, he reportedly never saw Zon, only the opening act, a local band called Lipps. As is always the case, negative press goes a long way, and the band never recovered. Although CBS demanded retribution for the impact on the band's growing popularity, not a penny was ever seen. CBS exercised their options to a third Zon lp, just before doing a major overhaul at headquarters. Among many others, Gallo was now gone and the label sent the band packing, as it did many other Canadian groups. The subsequent legal battle took the wind out of the band's sails, but signed with Falcon Records in the spring of 1980. They recruited Gallo as producer and I'M WORRIED ABOUT THE BOYS hit the shelves later that year, which featured a live version of Velvet Underground's "Sweet Jane," backed with "Takin' The Easy Way Out" as the first single. Two more singles followed - "For You" and "Better Get Up." Though still progressive in nature, the album showed a maturity in the writing and leaned a little more to the more palatable pop side. In support of the album, they latched on to the Alice Cooper tour, but when Cooper was unable to perform at Toronto's CNE Stadium due to a reported throat infection, it was Young who was given the unpleasant task of breaking the news to the packed house following their opening show. A riot ensued, police were called in, and Zon barely got away unscathed. The band broke up shortly after that, despite the single "For You" reaching #2 on CKOC in Hamilton, their highest charting ever. 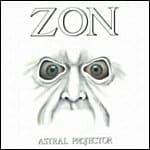 Digipak released ASTRAL PROJECTOR and I'M WORRIED ABOUT THE BOYS as a double album in 2005. By then, all the members had gone on to other projects. Young would appear on several other artists' albums, including former Act Three bandmate Rik Emmett. Hunt joined Hanover Fist and then Urgent for one album each, then Moxy, where Samson also stayed for awhile. Hunt and Miller would later both also work for music equipment companies in Toronto. Helm joined Fury, which evolved into Refugee, then took a road job with Mick Ronson and Ian Hunter, and eventually opened a music production company in Tampa, Florida, writing music for films, commercials, and television.